Braemar Single Family Home Under Contract in 4 Days! 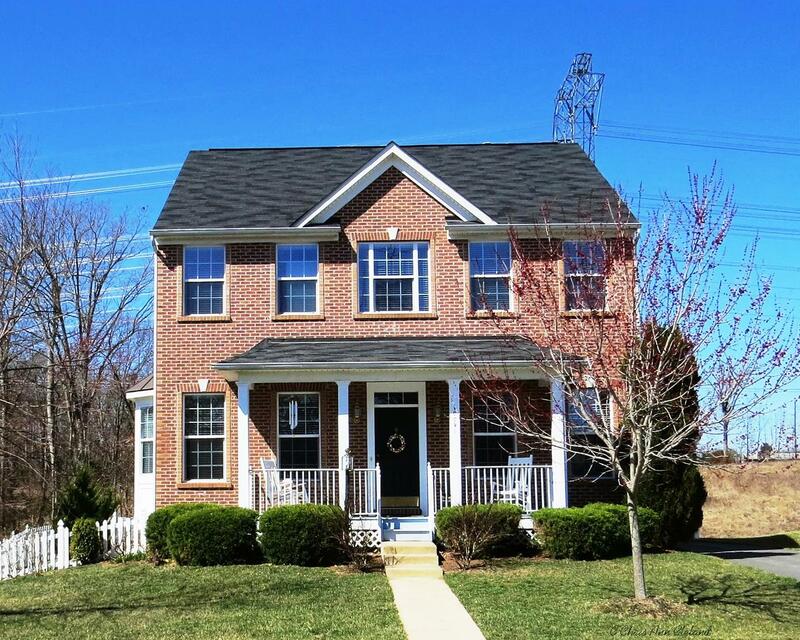 On April 24th (2015,) this Yardley model built by Ryan Homes located at 10062 Tummel Falls Drive, hit the market priced at $475,000. The home was the epitome of luxury living in Braemar. Heated bathroom floors, ultra modern fixtures, designer kitchen and bathrooms, teddy bear carpet in the family room, a screened porch and so much more. It only took four showings over four days for a buyer to put their intentions in writing and lock in this Braemar beauty for themselves. And that’s during a time when the market above the $450,000 mark is a little more sluggish. This home will settle in late May, so stay tuned for final details. When you are ready to sell your Braemar home, you want results. My expertise in online market, and knowledge of the neighborhood, gets the job done. No One Knows Braemar Better! This unassuming white vinyl siding home at 10062 Tummel Falls Drive, at first glance, probably seems no more remarkable than any other home on the street. To make that assumption, you would be missing out on one of the most unique finds in Braemar. 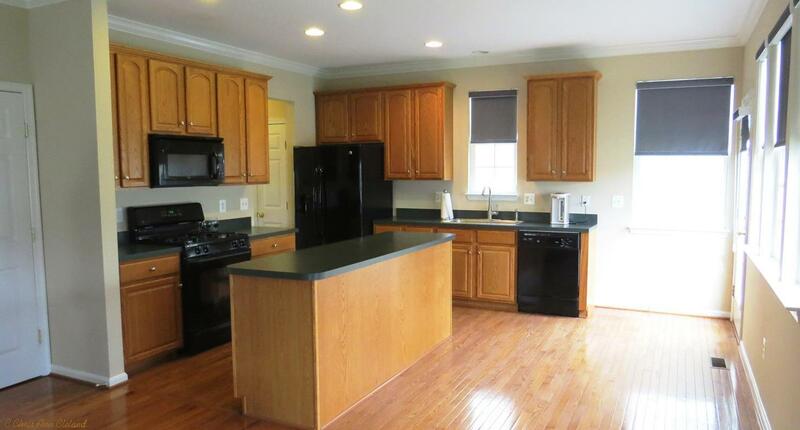 To begin with, this is a Yardley model by Ryan Homes, not a Yardley by Brookfield Homes. Of the 2,801 homes in Braemar, only 13 are Yardleys by Ryan Homes. The odds of one being on the market when you are looking to buy are not in your favor. Not like the 331 Yardleys by Brookfield which seem ever present in the resale market. The uniqueness of the floor plan will definitely stand out when you see it in person. The foyer entry have a formal dining room to the left, behind two decorative pillars, and a formal living room to the right with a decorative pillar defining the right most boundary of the room. The staircase that widens with a natural wood and white spindle banister, creates the far left boundary of the living room. Both formal rooms have plantation shutters, along with afaux marble finish on the pillars, which gives an air of sophistication. What you won’t notice standing in the foyer, but is one of the many details that makes this home a rare find, is the chandelier in the foyer is on an automated system that raises or lowers the light fixture for easy cleaning and light bulb replacement. If you are anything like me, you probably didn’t even know that type of thing existed. There are three pass throughs to the back of the home. 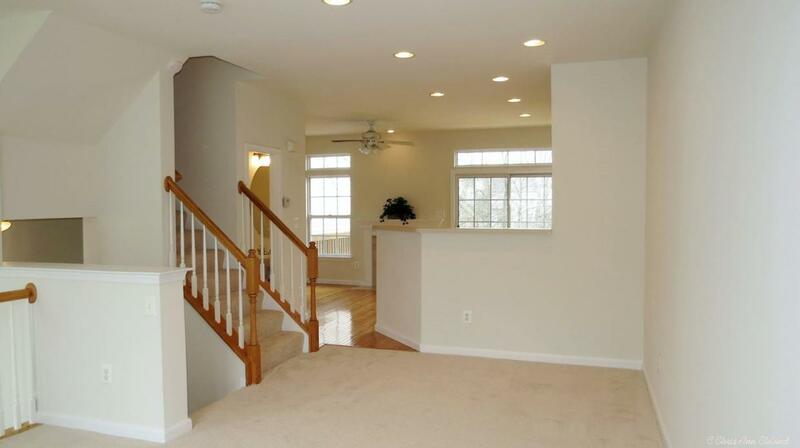 If you take the one from the formal living room, past the staircase, you walk directly into the family room. If you take the one from the dining room, you end up in the kitchen after passing the pantry on the right. There is a pass through in the middle of the two that walks past the main level powder room into the breakfast area. 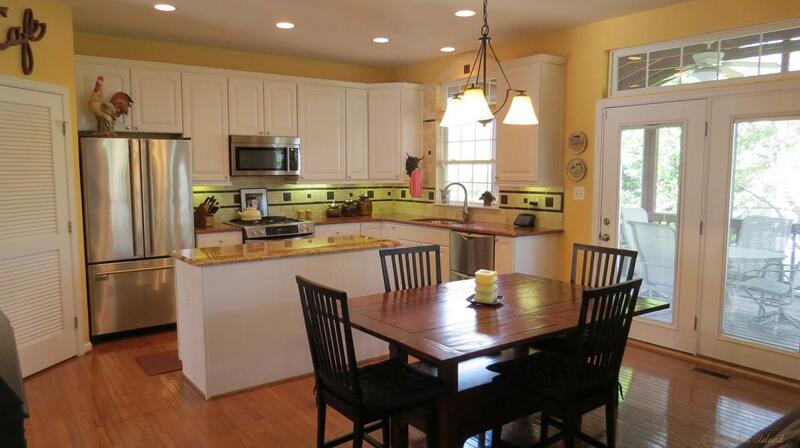 The kitchen, breakfast area and family room are completely open to one another, which is a style most buyers prefer. The designer kitchen offers everything you need, and things you didn’t even know you needed, but won’t want to live without, like the double decker dishwasher. The stainless appliance suite does include a French door refrigerator, gas range and microwave. Finishes here include the white cabinets, ceramic backsplash even up and around the kitchen window, and contrasting granite counters in rust to the more golden toned island. Cooking your first meal here, you will likely feel you entered into the pages of an interior design magazine. Hardwood floors are found throughout the main level, with the exception of the carpeted living room, mud room/laundry room, and the family room which has the softest teddy bear carpet your feet will ever walk on. Appropriate for the lounging that happens every day in a family room. 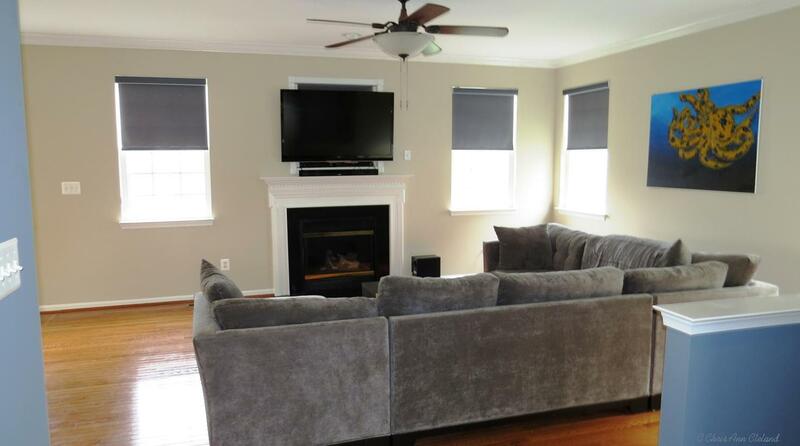 The gas fireplace, and more informal wood blinds, also add to the coziness factor. Off the breakfast area is a screened porch that you can enjoy the majority of the year, sitting atop your fully fenced, lightly wooded back yard. Evergreens provide a year round screen for privacy. An open area of the deck, done in composite material, is a perfect location for the grill. Time to go the bedroom level. The second, third and fourth bedrooms are all good sized. Some have plantation shutters, others don’t. They all have plenty of space. 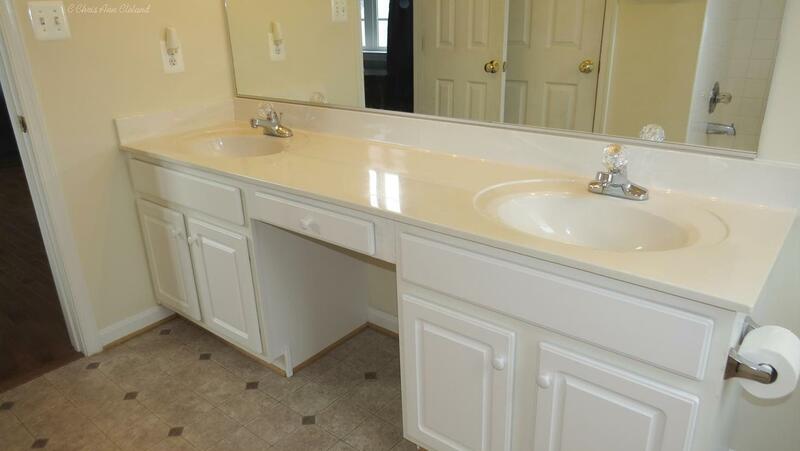 And they share the hallway access to the second full bathroom, which has double sinks/vanity. Why didn’t I start with the Master Suite? Because it is jaw dropping in the space and amenities. The room itself is enormous…on par with what you might find in a Canterbury model by Brookfield Homes. The vaulted ceiling certainly adds to that spaciousness. And designer touches, like wall sconces that bring soft light to the room evenly, are absolute perfection. The things you would expect a Master Suite like this to have, it does, like two walk-in closets and an attached luxury bathroom. And when I say luxury bathroom, it isn’t just ceramic tile and a soaking tub. 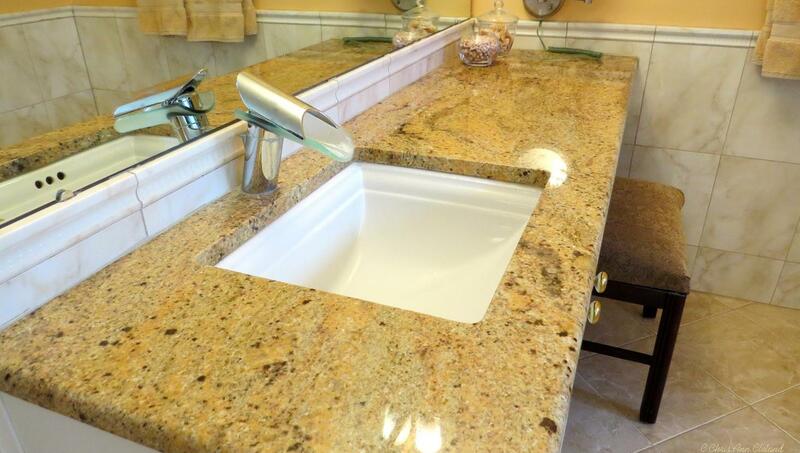 The Master Bathroom is finished with granite counters on the separate vanities and ultra modern fixtures. 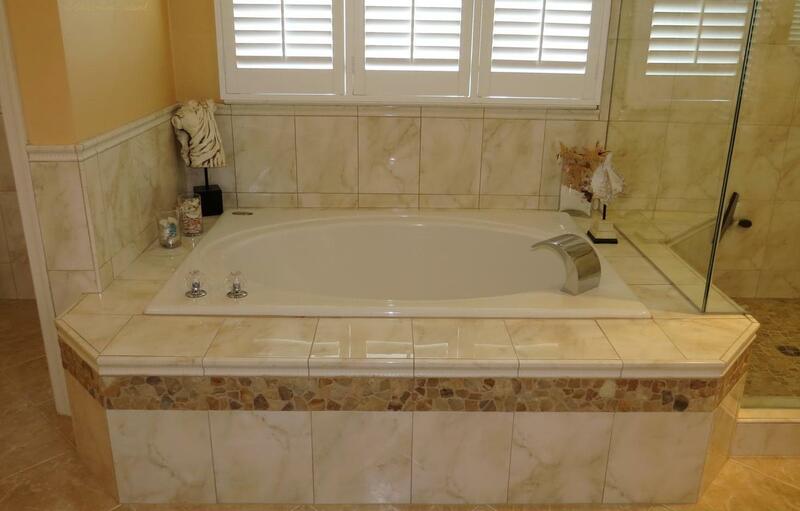 The flooring is ceramic tile with river rock accents. The seamless shower has a river rock floor. The soaking tub has a river rock listello. 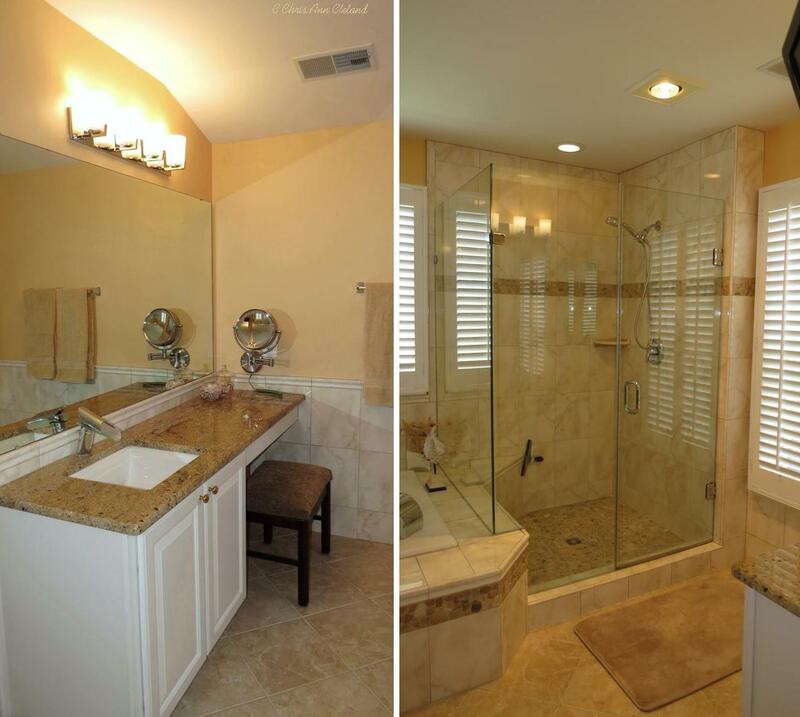 And when you flip one particular switch on the wall, your feet will be spoiled again by the heated bathroom floors. 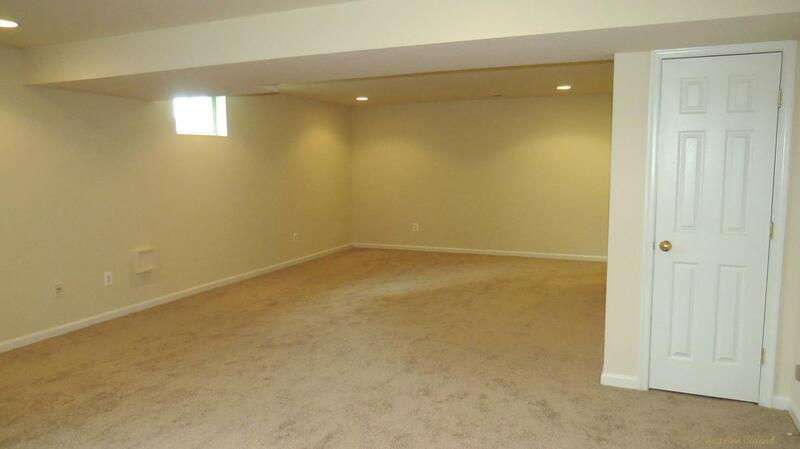 The full, walk-up exit basement is unfinished and offers plenty of space for storage. However, if you wish to finish it, there is a rough for a full bathroom here. Conceivably, you could finish a den, full bathroom, recreation room and still have plenty of unfinished storage. The garage, on the other hand, is completely finished, including a Harley Davidson inspired stripes on the painted walls. Now you know why you never judge a white, vinyl sided home, by unassuming outward appearances. For luxury living in Braemar, this single family home more than fits the bill. Let’s set up your tour today. Give me a call. No One Knows Braemar Better! Braemar Carriage Home Under Contract in Seven Days! This Parkdale model Carriage home in Braemar, located at 13805 Tartan Hills Parkway, hit the market on April 15th (2015) priced at $395,000. After four days on the market, a buyer called her agent back from vacation to write up an offer on the home. It took a few days to iron out the terms that were acceptable to both the Buyer and the Sellers, but on April 22nd, it was officially under contract. Selling Braemar homes is my specialty. The combined resources of my own in depth knowledge of the neighborhood, as a Braemar home owner myself, and my online marketing techniques that go beyond putting your home in the MLS, help you land the Braeamr buyers faster and for great terms. Call me when you are ready to sell your Braemar home for a free market analysis. No One Knows Braemar Better! 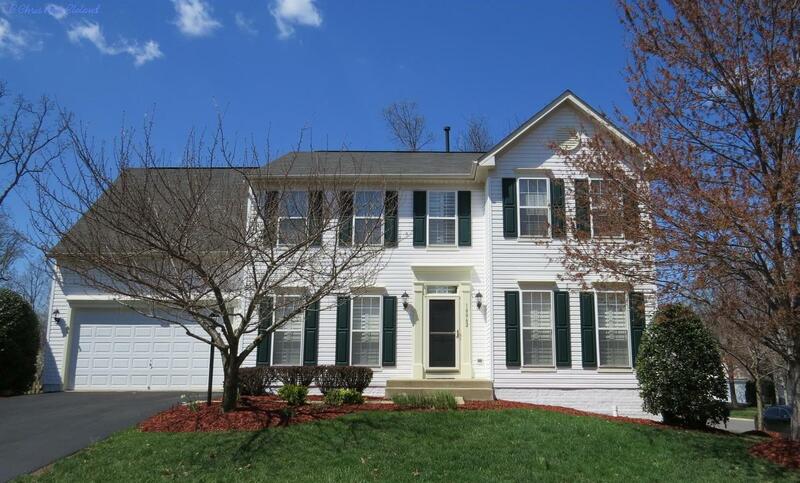 On March 11th (2015,) I had the pleasure of listing 10153 Pale Rose Loop in Braemar for sale at $299,000. At the listing appointment, a couple weeks previous, I had told the Seller that the home needed a fresh face. The interior paint was worn and dark. The carpets were inconsistent in style and tired. Fresh paint and new carpet made all the difference in making this rather small garage townhouse in Braemar stand out to buyers. Those new finishes, with the brick front and location backing to woods got this townhouse chosen over larger ones on the market. I was actually surprised that it took a little more than a week to get an offer, but we were still dealing with snow storms at that time. On March 21st, we had two offers in hand and one of the buyers made an offer the Seller couldn’t refuse. They waived their home inspection contingency. The buyers had a coinciding settlements contingency, which meant the home they had that was currently under contract, had to settle for them to be able to purchase the townhouse. Much preferred to a home sale contingency when a home that a buyer has to sell hasn’t either hit the market, or gone under contract. The successful settlement happened on April 20th for $300,000. 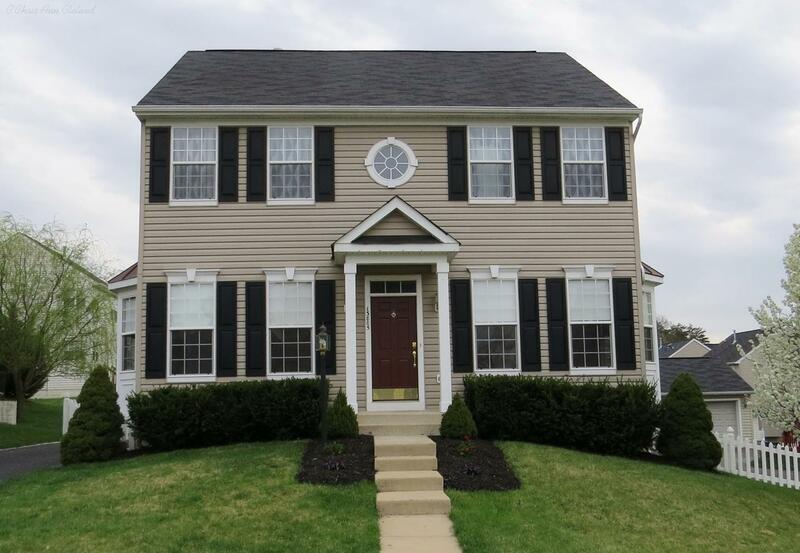 The Seller agreed to a $9,000 closing cost credit to the Buyers. If you have a Braemar townhouse, or single family home, you are ready to selll, give me a call for a free market analysis. No One Knows Braemar Better! As you crest the hill, past the second circle of Tartan Hills Parkway, you often see cows grazing in the pasture of the farm beyond the end of the road. That is the setting for this Braemar Parkdale model at 13805 Tartan Hills Parkway. The things that make the Parkdale model one of the most popular homes in Braemar are things you’ll find in this Parkdale. The floor plan inside is the same. 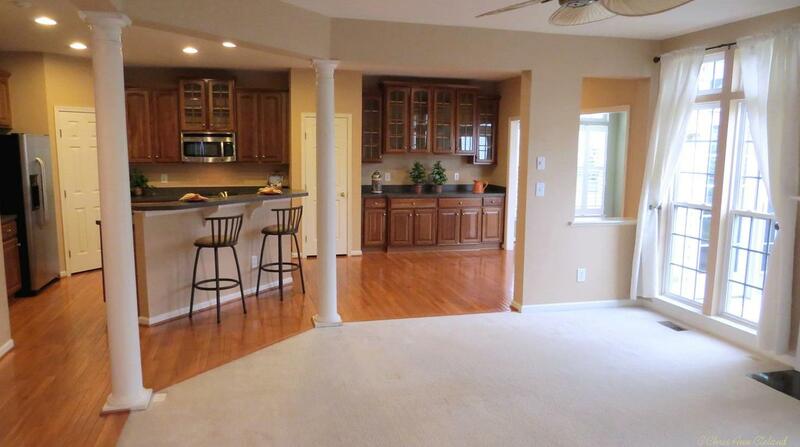 Casual and friendly family room that is open to the kitchen and breakfast nook. The formal living and dining rooms are opposite each other as you enter the foyer. 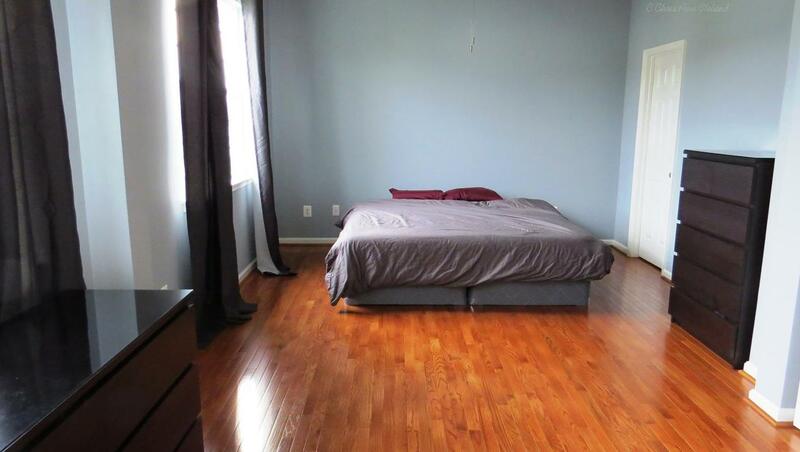 What makes this Parkdale different are the hardwood floors that take you through the main level and the bedroom level. 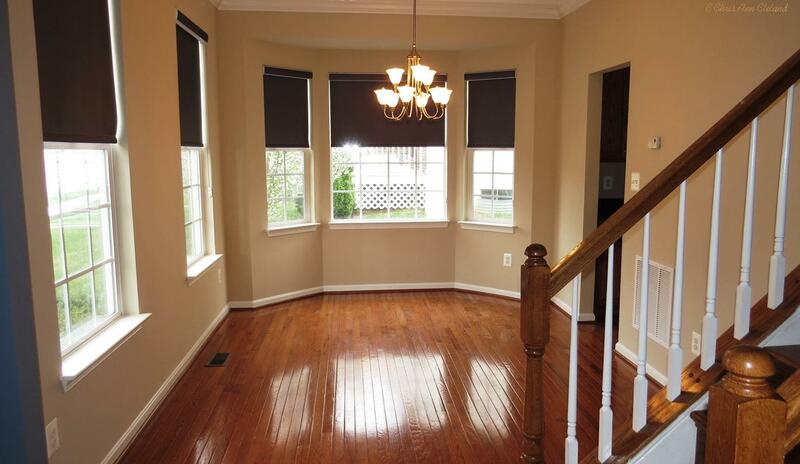 There is even a hardwood staircase between the floors. 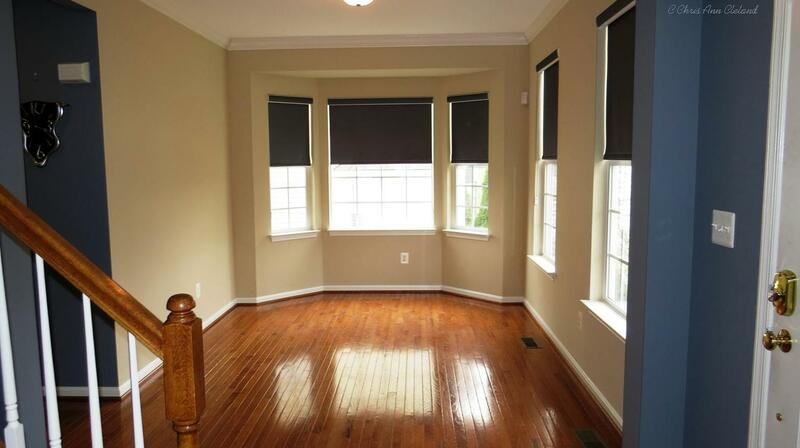 Bay windows were upgrades added to this Carriage home in the living and dining rooms. 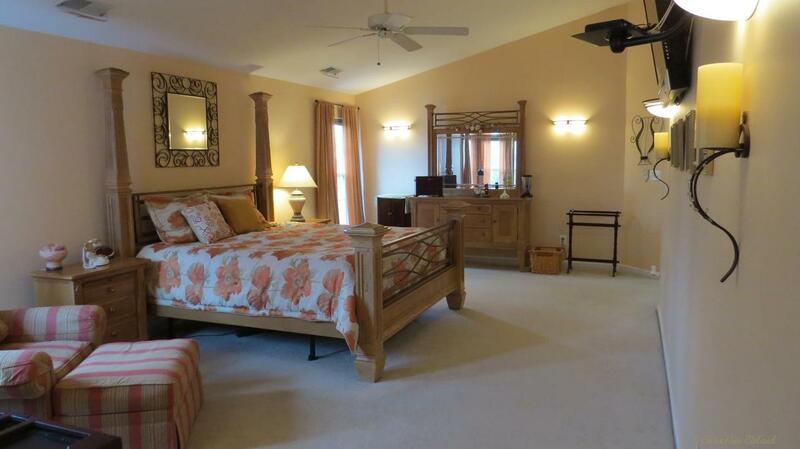 The Master Suite is huge, allowing for a sitting area in the bedroom, or just one big room. 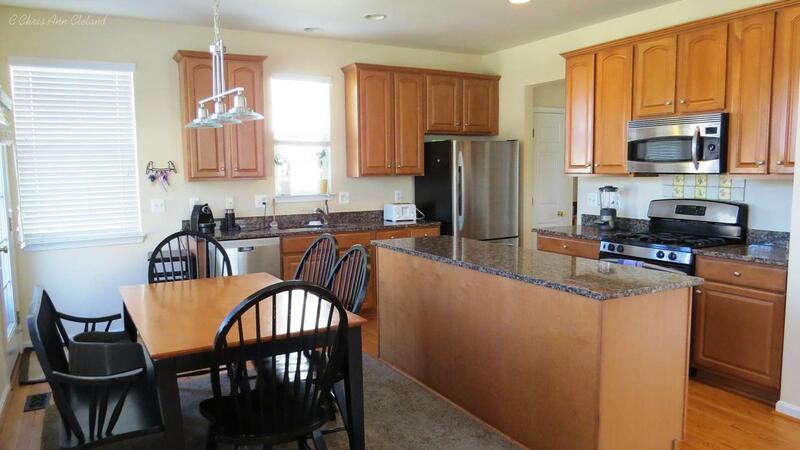 There is also a large walk-in closet and attached full bathroom with dual sinks/vanity. The basement is partially finished to give you a recreation area sporting brand new carpet. If you wish to finish the basement to include a den and full bathroom, you can do that and still have a bit of storage area. Outside, you have your own driveway to the left side of the home. 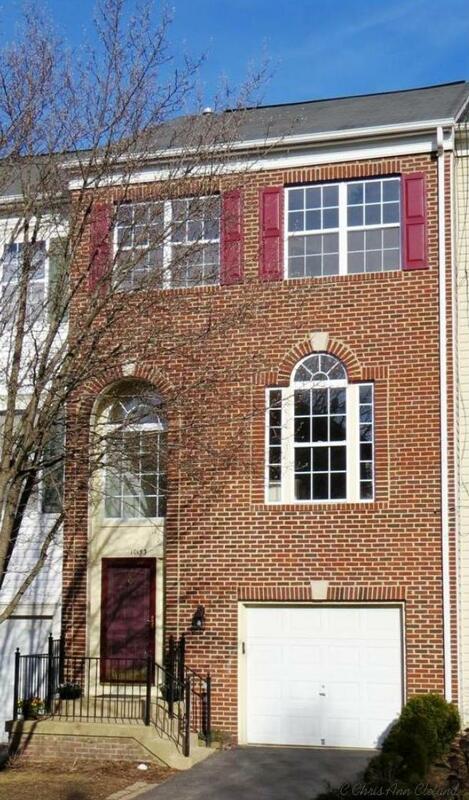 The detached two car garage is behind a gated entrance in the fully fenced back yard. And like all Braemar Carriage home, the fence is of the white picket variety. Priced at $395,000, this Braemar Carriage home won’t last long. If you want to see it, call me to set up a tour. The Sellers of this Braemar Short Sale decided that forty-two days on the market was enough at their list price of $499,000. A second look at comparable sales revealed that nine other Braemar single family homes, that were similar in size, had gone under contract in that time. It wasn’t a lack of buyers in the market, but the market deciding to buy other properties, so an adjustment was in order. Now listed for $478,000, this gorgeous home at 13519 Marr Lodge Lane is ready for a patient buyer willing to wait sixty-ninety days for Short Sale Approval. Take a look at the single property website. 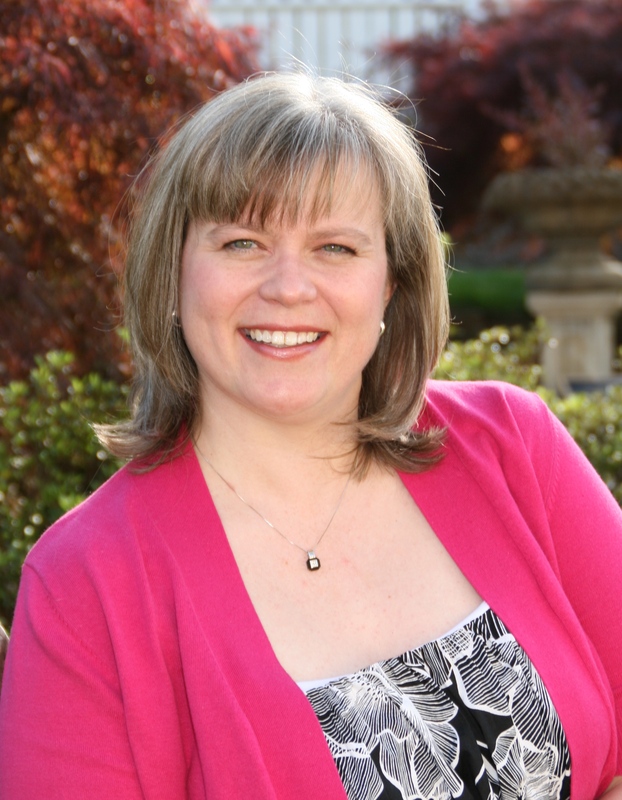 If you would like to schedule a tour, give me a call. No One Knows Braemar Better! Braemar Carriage Home Under Contract in Ten Days! 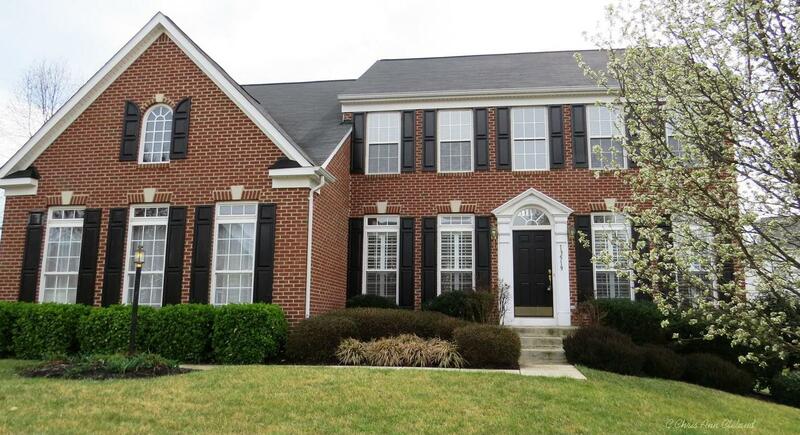 This Parkdale model at 10091 Broadsword Drive hit the market on April 1st priced at $398,000. The property certainly hit a happy spot with Braemar buyers. 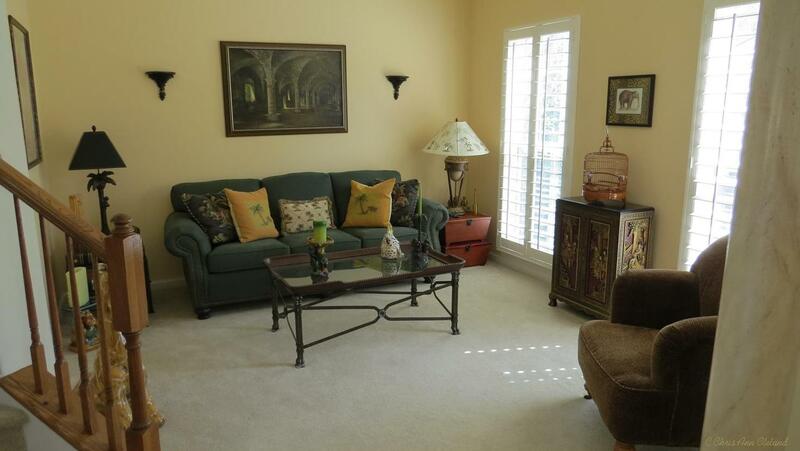 The Seller had multiple showings every day, including Easter. 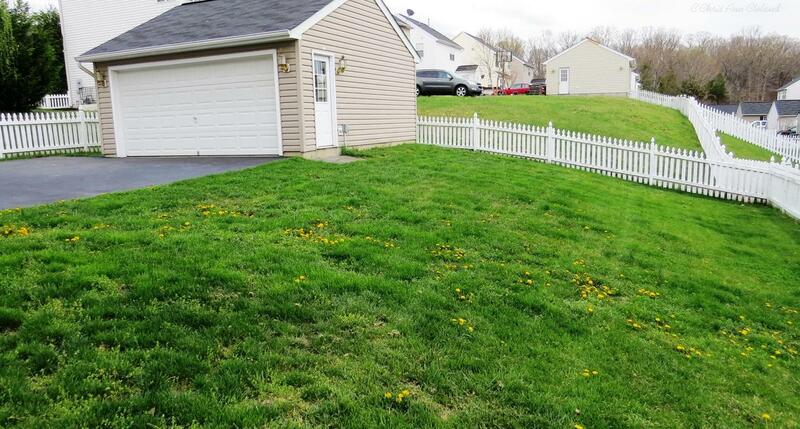 After receiving multiple offers, it went under contract on April 11th. Stay tuned for the final sales price. In the meantime, when you are ready to sell your Braemar home, give me a call for a free market analysis and let’s take advantage of this buyer demand for our neighborhood. No One Knows Braemar Better!